It was shown to the public as part of AMC’s “Concept 80" campaign in 1977. AMC had an all-new subcompact vehicle platform in the advanced design stages at the time, but later concluded that the company didn’t have the money to tool up a completely new design. Its small size and expected low price would have likely made it an unprofitable venture, anyway. 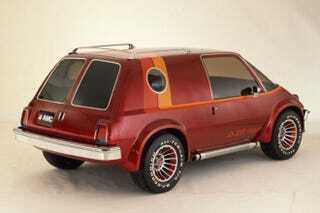 But the AM-Van, AMC’s 4WD turbocharged subcompact minivan, debuted to massive public interest when it was shown in 1977. I think it looks fabulous. It&apos;s a second Jeep (minivan) Thing. Do you understand yet?